1938 was only twelve years after Robert Goddard's first successful flight of his liquid-fueled rocket. Goddard's proposals for flight beyond the earth's atmosphere, including launching of scientific instruments and even humans, were met with derision from many fellow scientists and especially those men known for their keen insight into humanity - newspaper editors. Even the idea of using a parachute for recovery was deemed ridiculous. NACA (National Advisory Committee for Aeronautics), NASA's predecessor, had not yet implemented an outreach program to Muslims, so it was necessary to rely on Goddard's ingenuity to do the development that, along with German stabilization technology, evolved into our world-leading manned space exploration program, which, BTW, ended nearly a year ago with the retirement of the Space Shuttles. Oh yeah, feel'n the hope and change these days - and plenty peeved that our "leaders" are allowing our hard-earned technical lead slip away. 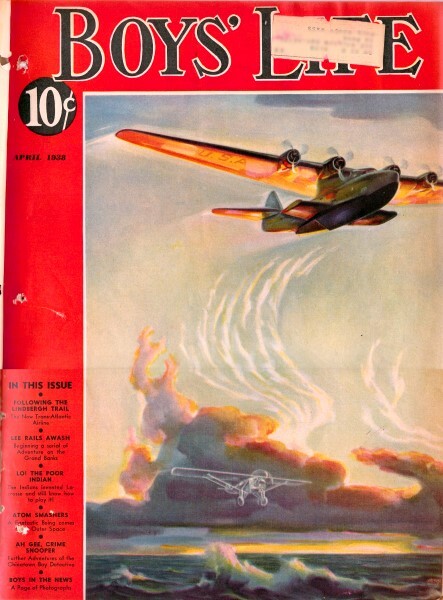 Anyway, the April 1938 edition of Boy's Life ran this full-page feature on the current state of the space program. It is always interesting to have a look back at how we got to where we are today as reported while events were unfolding. You can click on the image below for a larger version that should allow you to read the text. I have also OCR'ed the text and posted it underneath the image. EXPLORING the stratosphere and literally reaching for the moon is the objective of the American Rocket Society, Inc., with offices in New York City. Things actually move so fast in this field of scientific experimentation that almost before a rocket is dispatched into space, it is made obsolete by an entirely new type that meanwhile has been invented. (1) Here is one of the latest types being adjusted preparatory to firing. (2) At the proving grounds showing the rocket in position for firing with its charge of liquid fuel being added. (3) America has devoted most of its attention to liquid fuels, which leave no spectacular wake of smoke as do the dry fuel rockets of Germany. (4) Dr. G. Edward Pendray and his associate John Shesta of the American Rocket Society are photographed inspecting a new type of rocket destined for an interstellar trip. (5) Nearly every other nation has its group of interplanetary science enthusiasts corresponding to our American Society; here in Japan enthusiasm runs high as this rocket is launched somewhere outside of Tokyo. 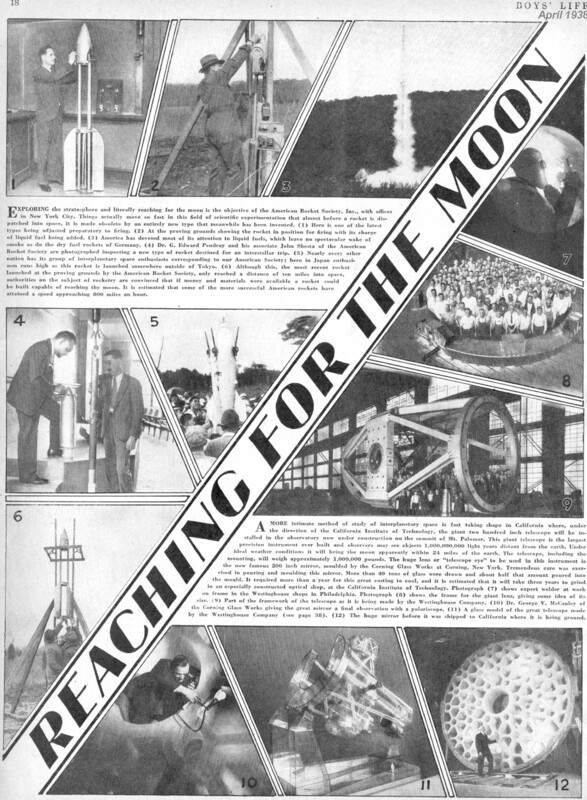 (6) Although this, the most recent rocket launched at the proving grounds by the American Rocket Society, only reached a distance of ten miles into space, authorities on the subject of rocketry are convinced that if money and materials were available a rocket could be built capable of reaching the moon. It is estimated that some of the more successful American rockets have attained a speed approaching 800 miles an hour. A MORE intimate method of study of interplanetary space is fast taking shape in California where, under the direction of the California Institute of Technology, the giant two hundred inch telescope will be installed in the observatory now under construction on the summit of Mount Palomar. This giant telescope is the largest precision instrument ever built and observers may see objects 1,000,000,000 light years distant from the earth. Under ideal weather conditions it will bring the moon apparently within 24 miles of the earth. The telescope, including the mounting, will weigh approximately 1,000,000 pounds. The huge lens or "telescope eye" to be used in this instrument is the now famous 200 inch mirror, moulded by the Corning Glass Works at Corning, New York. Tremendous care was exercised in pouring and moulding this mirror. More than 40 tons of glass were drawn and about half that amount poured into the mould. It required more than a year for this great casting to cool, and it is estimated that it will take three years to grind in an especially constructed optical shop, at the California Institute of Technology. Photograph (7) shows expert welder at work on frame in the Westinghouse shops in Philadelphia. Photograph (8) shows the frame for the giant lens, giving some idea of its size, (9) Part of the framework of the telescope as it is being made by the Westinghouse Company. (10) Dr. George V. McCauley of the Corning Glass Works giving the great mirror a final observation with a polariscope, (11) A glass model of the great telescope made by the Westinghouse Company (see page 38). (12) The huge mirror before it wee shipped to California where it is being ground.